STYX-CAUGHT IN THE ACT LIVE. 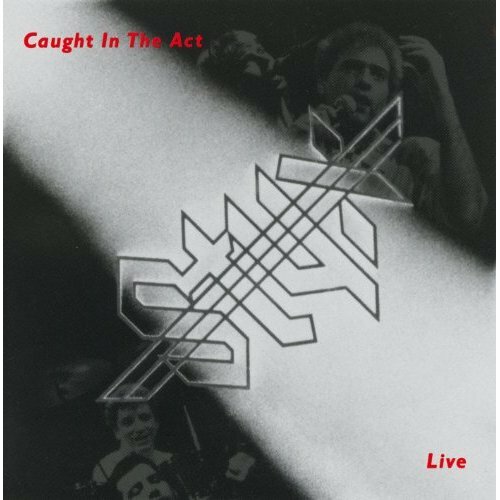 By April 1984, the members of Styx should’ve been preparing for the release of the twelfth album of the band’s career Caught In The Act Live, which was recently reissued as a two CD set by BGO Records. However, by then, Styx had split-up citing musical differences which had divided the band over the last couple of years. It was the end of an era. Styx also missed on something that was seen as a rite of passage for rock groups during the seventies and eighties, to release a live album. This was one thing that Styx hadn’t done, and they had achieved pretty much everything else since they released their eponymous debut album on Wooden Nickel Records in September 1972. It was the start of a glittering career for the band that was formed in the Roseland neighbourhood of Chicago in 1960. That was where twelve-year old twin brothers Chuck and John Panozzo first began making music with their neighbour, Dennis DeYoung who was fourteen. Initially, John Panozzo played drums while Chuck started off as a guitarist and Dennis DeYoung played accordion, and later became the nascent group’s vocalist. However, two of the three musicians would change instruments within a few years. Before that, the three young musicians were practising whenever they had some free time. This practise paid off, and by 1964 the group which was now called The Tradewinds, was now a quartet. Chuck Panozzo had just returned after spending a year in a seminary. During that period, he had been replaced on guitar by Tom Nardin. However, on his return, Chuck Panozzo decided to switch to bass. The other change was that Dennis DeYoung had switched from accordion to piano and organ. After the latest change in the group’s lineup, The Tradewinds continued to play on Chicago’s live scene for the rest of 1964. During 1965, another band The Trade Winds was enjoying commercial success nationally, and the Chicago-based The Tradewinds decided to change their name. After some thought, The Tradewinds decided to change their name to TW4 (They Were Four). In 1966, the Panozzo brothers decided to enrol on a teacher training course at Chicago State University which was where Dennis DeYoung was a student. Still TW4 continued to play at high schools and sometimes at functions and fraternity parties. This allowed TW4 to hone and tighten their sound over the next few years. Nearly six years after Tom Nardin had joined TW4, he left the group in 1969, and was replaced by John Curulewski a college friend of the Panozzo brothers. However, this wasn’t the end of the changes in TW4’s lineup. A year later, in 1970, guitarist James “JY” Young, who was studying at the Illinois Institute of Technology was joined TW4. With the man who would later be given the nickname The Godfather onboard, the lineup of the group that would become Styx was complete. In early 1972, TW4 had been booked to play a concert at St. John of the Cross Parish, in Western Springs, Illinois, which was home to the band’s newest recruit James “JY” Young. When TW4 took to the stage, they were unaware that an A&R scout from Wooden Nickel Records was in the audience that night. He liked what he saw, and after the concert made his way backstage where he met TW4. Soon, the band was being offered their first recording contract. However, there was a problem the band’s name. The five members of TW4 began thinking of alternatives names, and various names were considered, but quickly rejected. After some thought, the band chose Styx which in Greek mythology is the river that connects earth and the underworld. With their new name, Styx began work on their debut album. In September 1972, Styx which was produced by John Ryan and Bill Traut was released on Wooden Nickel Records. The album which married progressive and hard rock received mixed reviews and stalled just outside of the US Billboard 200 at 207. However, when Best Thing was released as a single, it reached eighty-two in the US Billboard 100 and gave Styx a minor hit single. This was something for Styx to build on. 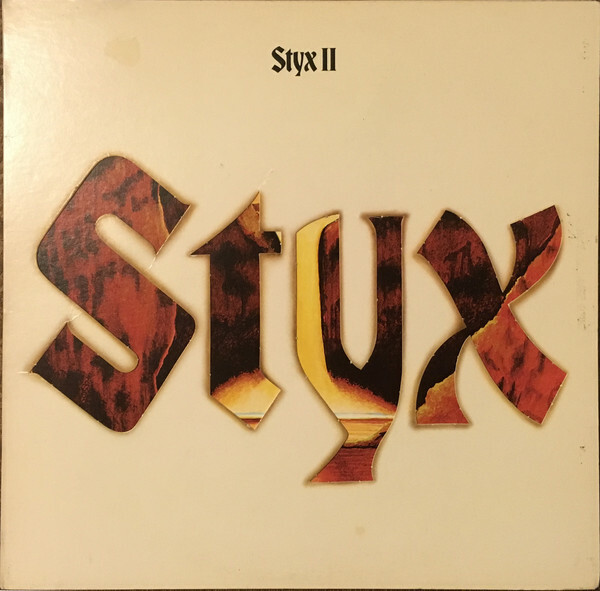 When Styx II was released in July 1973, the John Ryan produced album was well received by critics who were won over by a carefully crafted fusion of progressive rock and hard rock. This also found favour with record buyers, and Styx II reached number twenty in the US Billboard 200. Buoyed by the success of the single Lady, which reached number six in the US Billboard 100, Styx II sold over 500,000 copies and was certified gold. This was the start of a glittering career for Styx. 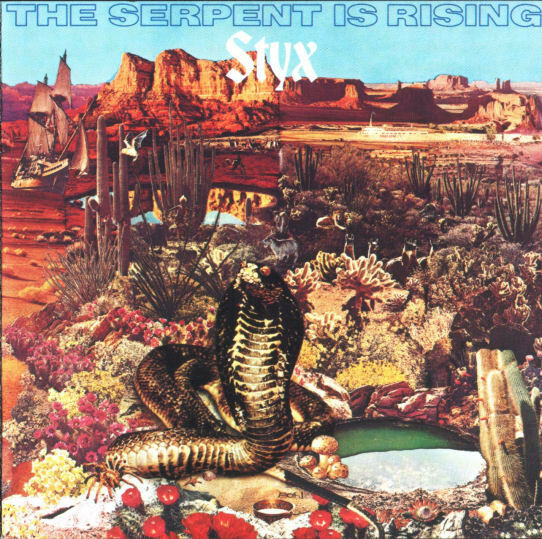 Just three months after the release of Styx II, The Serpent Is Rising was released in October 1973, and can be loosely described as a concept album, which were hugely popular in 1973. However, The Serpent Is Rising which was another album were Styx flitted between and fused progressive rock and hard rock wasn’t a commercial success and crept into the US Billboard 200 at a lowly 192. Even the members of Styx have never been happy with The Serpent Is Rising, and Dennis DeYoung went as far as to say that it was: “one of the worst recorded and produced in the history of music.” It was no surprise that the members of Styx were keen to atone for The Serpent Is Rising. Just over a year later, and Styx returned in November 1974 with Man Of Miracles. It was another album of progressive rock and hard rock, which was well received critics. 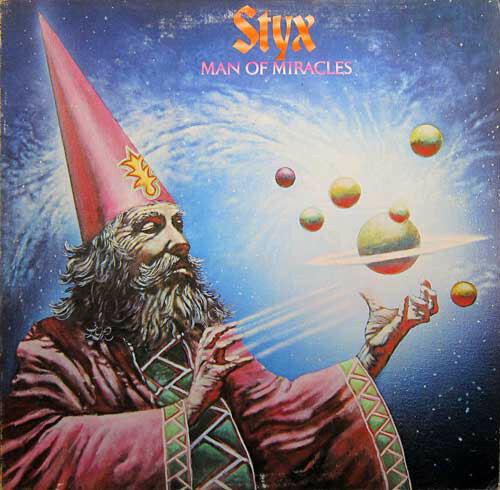 However, Man Of Miracles stalled at 154 in the US Billboard 200, which was a disappointment to Styx. Despite the disappointing sales Man Of Miracles, A&M Records were keen to sign Styx, who were keen to join a major label. Styx accepted A&M Records’ offer and in 1975 they became a major label band. Meanwhile, by Bill Traut Jim Golden and Jerry Weintraub who owned Wooden Nickel Records were far from happy that their biggest signed had been poached by a major label. They immediately sued Styx for breach of contract. Things were about to get messy, and costly. No long after Styx left Wooden Nickel Records, the label ceased trading. This was a shock to its other signings, who had watched as Styx II had been certified gold. Now Wooden Nickel Records was no more, and by 1977 the label was disbanded. The label that had launched Styx was no more. Meanwhile, the members of Styx were in Paragon Recording Studios, in Chicago, where they were recording their major label debut, Equinox. This was the first album that the five members of Styx had produced themselves. They stuck to their tried and tested formula of progressive rock and hard rock on Equinox. It was released on the ‘1st’ of December 1975 and would reached fifty-eight in the US Billboard 200. Equinox was certified gold in America and platinum in Canada. However, before that, Styx was thrown into turmoil. Just after the release of Equinox, guitarist John Curulewski left the band unexpectedly. This couldn’t have come at a worst time as Styx was about to head out on tour. Fortunately, Styx secured the secured the services of guitarist Tommy Shaw. He made his Styx debut on the forthcoming tour. With John Curulewski having left Styx, Lorelei which was released as a single in 1976, was the last single to feature the original lineup of the band. It reached twenty-seven in the US Billboard 200, and have Styx their second top thirty hit single. The success of Lorelei helped sales of Equinox and in 1977 it was certified gold. By then, Styx had released two new albums. The first of these two albums was Crystal Ball which marked the debut of Tommy Shaw, was produced by Styx and released on the ‘1st’ of October 1976. Although Styx were rocking hard on Crystal Ball, and continued further down the road marked progressive rock, Shooz was a blues rocker and Clair De Lune/Ballerina was inspired by French classical composer Claude Debussy. 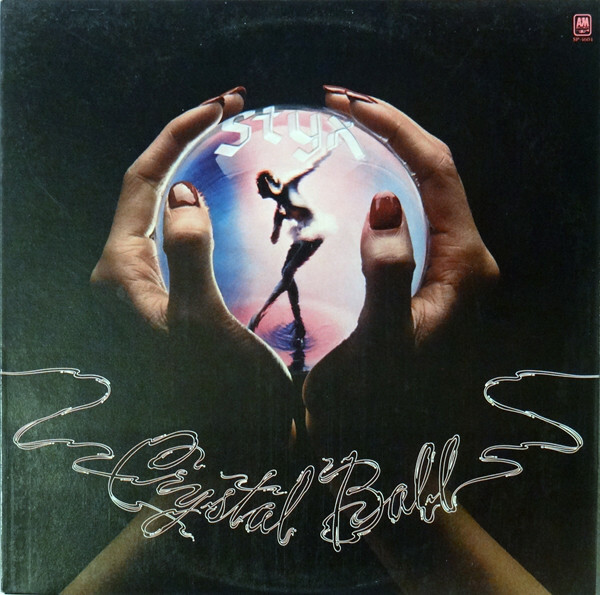 However, the most popular track was Crystal Ball which would become a staple of Styx’s live sets. Despite an album full of energy, excitement and poppy hooks, Crystal Ball received mixed reviews and reached just sixty-eight in the US Billboard. However, this was enough for another gold disc for Styx. Meanwhile, Crystal Ball was certified gold in Canada and Styx’s glittering career continued. Just like previous albums, Styx returned to the familiar surroundings of Paragon Recording Studios, in Chicago where they recorded their seventh album The Grand Illusion. By then, Tommy Shaw was settling into his role as Styx’s lead guitarist, and had had written Fooling Yourself (The Angry Young Man) and Man In The Wilderness for The Grand Illusion. Tommy Shaw also penned Superstars and The Grand Finale with Dennis DeYoung and James “JY” Young. These songs would play their part in the success of The Grand Illusion. When critics heard The Grand Illusion, they discovered a genre-melting album which featured art rock, hard rock and progressive rock. Just like many progressive rock bands, there was a depth and substance to the lyrics which was missing in much of the disco, pop and soul being released in 1977. 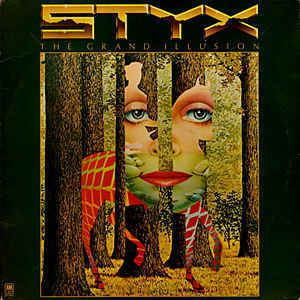 The lyrics to the songs on Grand Illusion loosely inspired by Styx’x interpretation of medieval history, while other songs were full of social comment, and reflected what the members of Styx thought of life. 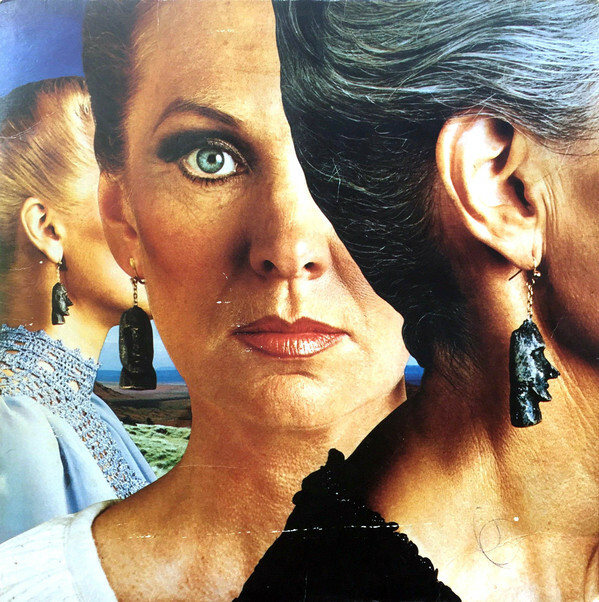 Styx’s carefully crafted seventh album The Grand Illusion was released to critical acclaim. As soon as The Grand Illusion was released on July the ‘7th 1977, the album started climbing the charts and eventually reached number six in the US Billboard 200. By then, it was well on its way to selling over three million copies and being certified triple platinum. This was helped by the success of the two singles. Come Sail Away reached number eight on the US Billboard 100 and Fooling Yourself (The Angry Young Man) reached twenty-nine in the US Billboard 100. Meanwhile, The Grand Illusion had been certified platinum in Canada. 1977 was the most successful year of Styx’s five year recording career. The members of Styx knew that trying to replicate the success of The Grand Illusion, which had sold over three million copies, wasn’t going to be easy. However, when the five members began work on their eighth studio album Pieces Of Eight, they were determined to give it their best shot as they returned to where they had recorded every album, Paragon Recording Studios, in Chicago. Over the next weeks and months, Styx recorded Pieces of Eight what is regarded as their second concept album. The album’s theme Dennis DeYoung explained was about: “not giving up your dreams just for the pursuit of money and material possessions.” During Pieces of Eight, Styx flitted between and fused elements of art rock, classic rock, hard rock and for the last time, progressive rock. There were also two instrumentals The Message and the album closer Aku-Aku which was one of four songs penned by Tommy Shaw. He was already playing an important part in the rise and rise of Styx. Just like The Grand Illusion, Pieces Of Eight was well received upon its release on the ‘1st’ of September 1978 and just like its predecessor reached number six in the US Billboard 200. Pieces Of Eight featured three singles, with Blue Collar Man (Long Nights) reaching twenty-one on the US Billboard 100, Sing For The Day forty-one and Renegade sixteen. Meanwhile, Pieces Of Eight followed in the footsteps of The Grand Illusion and sold over three million copies. Across the border in Canada, Styx received their third platinum disc. By then, Styx had sold over nearly eight million albums in North America just six years. Despite being one of the most popular American bands of the seventies, Styx decided to change things around when the time came to record their ninth album Cornerstone. This time, they eschewed the familiar surroundings of Paragon Recording Studios, in Chicago, and headed to the new Pumpkin Studios in Oak Lawn, Illinois where Styx rang the changes. In Pumpkin Studios Styx changed direction, and moved away from the progressive rock and art rock of previous albums towards a pop rock sound. This came after Dennis DeYoung read some reviews during a British tour that were far from complimentary. On his return home, he convinced the rest of Styx to change direction and record an album of pop rock, which should also appeal to a wider audience. Proof of this was Babe, which was one of two ballads Styx recorded for Cornerstone. Little did the band know they had recorded a song that would synonymous with Styx. With Cornerstone completed, A&M Records scheduled the release of the album for October the ’19th’ 1979. Before that critics had their say on Cornerstone. 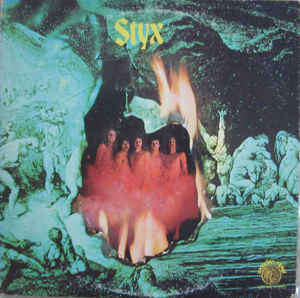 Most of the critics, apart from Rolling Stone, who seemed to have a vendetta against Styx, were won over an album that showcased a pop rock sound. That was apart from the folk-tinged Boat On The River which was later covered by a number of artists. However, Boat On The River played its part in the success of Cornerstone. Upon its release Cornerstone started climbing the US Billboard 200 and eventually reached number two and sold over two million copies. 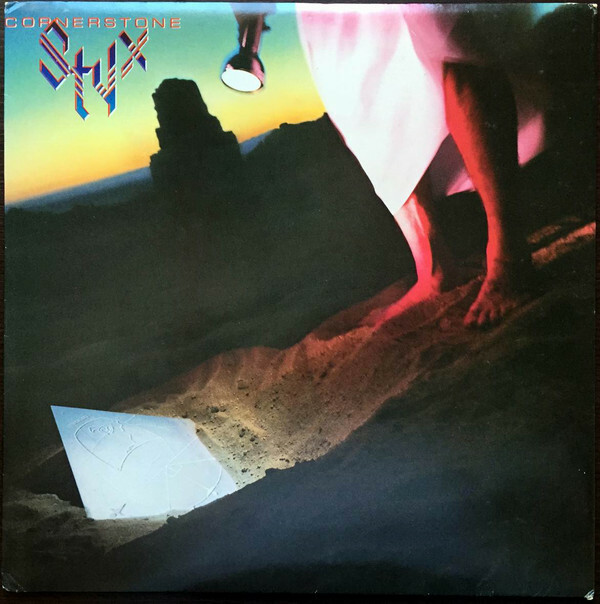 Cornerstone was Styx’s first album to be certified double platinum, although A&M Records contend that the album has now sold in excess of three million copies. That was no surprise as Cornerstone featured Styx’s first number one single Babe. Borrowed time reached sixty-three on the US Billboard 100 and Why Me twenty-six. The final single Boat On The River topped the charts in Germany and Switzerland. Styx’s ninth album had been a responding success, and was also certified platinum in Canada and gold in Germany, as their glittering career continued apace. Fifteen months later, Styx returned on the ‘19th’ of January 1981 with their tenth album Paradise Theatre. It had been recorded at Pumpkin Studios in Oak Lawn, Illinois and was the third concept album of Styx’s career. This time, the theme was a fictional account of the Paradise Theatre, in Chicago. Styx charted it’s opening right up to the day it closed its door and the eventual abandonment of this once proud theatre. Paradise Theatre was an album that struck a nerve with record buyers. When Paradise Theatre was released, it was mostly to critical acclaim. However, the increasingly cynical Rolling Stone magazine was still unwilling to give credit where credit was due. This was the latest example of churlish behaviour from the magazine, as Styx released a career defining opus. Upon its release Paradise Theatre topped the US Billboard 200, and was certified gold. Across the border, Paradise Theatre was certified platinum and silver in Britain. Styx also featured four hit singles including Nothing Ever Goes As Planned which reached fifty-four in the US Billboard 100. After that, Rockin’ The Paradise reached number eight, while Too Much Time On My Hands reached nine and The Best Of Times reached number three. By then, it was official that Paradise Theatre was the most successful album of Styx’s career. After the success of Paradise Theatre, just over two years passed before Kilroy Was Here was released on February the ’28th’ 1983. It was the third Styx album that was recorded at Pumpkin Studios in Oak Lawn, Illinois, and which was a somewhat controversial album title. Although the album title had been inspired by a famous piece of World War II graffiti, partly the album mocked Christian fundamentalist groups and their fellow anti-rock activists. They had gotten so disproportionately powerful in parts of America, that the Arkansas Senate were forced to pass a bill requiring that if a record contained backward masking it had to be labeled as such by the manufacturer. This included albums by The Beatles, Pink Floyd, Queen, the Electric Light Orchestra and even Styx, who found humour in something that had been the subject of debate since the late-sixties. Backmasking was popularised by The Beatles, and since then, many groups and artists had used the technique to add comedic, satiric and secret messages. However, the Christian fundamentalist groups and their fellow travellers believed backmasking was used to hide satanic messages. This resulted in the members of this intellectually challenged movement burning records while forcing state and federal governments to pass legislation. Styx had watched this unfold and were determined to have their say. To do this, they wrote what was essentially a rock opera where music is outlawed by a fascist and theocratic government and the Majority For Musical Morality (MMM). The protagonist of the story was a former rock star Robert Orin Charles Kilroy, who was played by Dennis DeYoung. He was imprisoned by the leader of the MMM played by James “JY” Young. When Robert Orin Charles Kilroy escapes from prison, he discovers a young musician Jonathan Chance, who is played by Tommy Shaw is on a mission to bring music back. This was the story that Kilroy Was Here told and when Styx toured the album. Before that, the genre-melting Kilroy Was Here was released to mixed reviews. Many critics were unsure what to make of where elements of new wave pop rock, progressive rock and rock were combined during a rock opera with a controversial backstory. Neither did record buyers. Although Kilroy Was Here reached number three in the US Billboard 200, it sold just over a million copies and was certified platinum. However, some within the music industry believed Kilroy Was Here sold just over 2.5 million copies. However, there is no proof of this, and the official album sales were a disappointment for the five members of Styx. Despite the disappointing album sales, three singles had been released from Kilroy Was Here. Don’t Let It End reached number six in the US Billboard 100, High Time forty-eight and Mr. Roboto number three. Meanwhile, Kilroy Was Here was certified platinum in Canada. After eleven albums, Styx had sold over 13.5 million albums in America and over 600,000 in Canada. Eleven years after releasing Styx, the Chicago based band were one of the biggest selling bands in America. Caught In The Act Live. Despite their success over the last eleven years, Styx still hadn’t gotten round to releasing a live album. By the time Kilroy Was Here was released on February the ’28th’ 1983, tension in the group building over the future direction of Styx. Dennis DeYoung was in favour of introducing ballads, which James “JY” Young were dead against. Styx was a very much group divided, and that was why it was decided that they should record Caught In The Act Live. Things had gotten so bad that the members of Styx were even considering calling it a day. The only problem was that Styx still owed A&M Records one more album. There was no way that A&M were going to free Styx from their remaining contractual obligations. However, if Styx recorded a live album, this meant that they would’ve fulfilled their contractual obligations. That was why when Styx embarked upon another gruelling tour, for two nights the tapes would be running to record Caught In The Act Live. As Styx embarked upon another lengthy tour where the group went to coast to coast, the band, their management and A&R Records knew that there were plenty of potential venues to record a live album and concert film. Eventually, after much consideration Styx and their management decided to record the live album Caught In The Act on the ‘9th’ and ‘10th’ of April at the small, but atmospheric Saenger Theatre, in New Orleans. The venue held just 2,736 people who would be able to tell their friends and family that they were there when Styx recorded Caught In The Act Live. When Styx’s tour bus rolled into the Big Easy, little did any of the audience realise that was due to attend the show realise that this was the end of an era. Never agin would this lineup Styx take to the stage. This was how deep the divisions in the group were. Certainly, as the fans started arriving at the Saenger Theatre on ‘9th’ of April 1983, nobody was aware that they were about to be present when what many regard as the classic lineup of Styx made their last recording. That night, and on the ‘10th’ of April 1983, Styx’s rhythm section featured drummer and percussionist John Panozzo, bassist and vocalist Chuck Panozzo who also ‘plays’ the bass pedals. The twins were joined by Tommy Shaw who played acoustic, electric and lead guitar while adding vocals and deploying a vocoder. James “JY” Young also played electric and lead guitar, added vocals and sometimes switched to synths. Meanwhile keyboardist Dennis DeYoung added vocals on what he realised was Styx’s swan-song. The song that opens Caught In The Act Live album was the only song not recorded in New Orleans. Instead, it was recorded in the studio and features an emotional and almost dramatic vocal. It then gives way to the rest of Caught In The Act Live which was recorded at the Saenger Theatre in New Orleans. 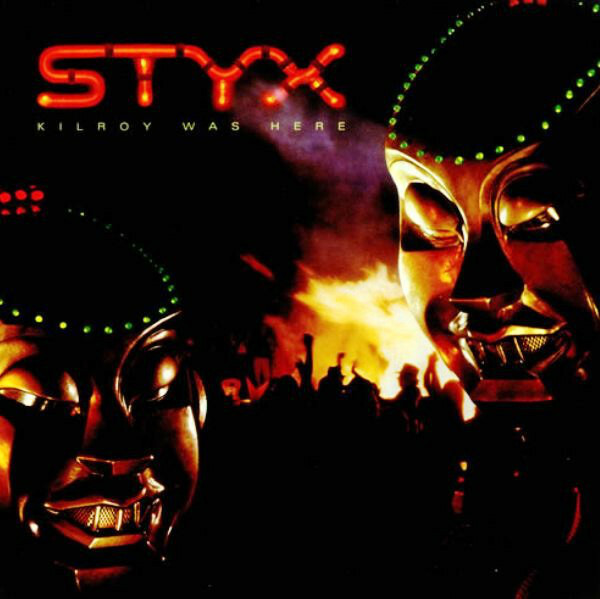 When Styx took to the stage the Saenger Theatre in New Orleans, they opened they launched into Mr. Roboto from their previous album Kilroy Was Here. It’s followed by Too Much Time on My Hands where Tommy Shaw takes charge of the lead vocal. It’s followed by Babe where Dennis DeYoung takes charge of the vocals on this beautiful ballad, which was the direction he wanted to take Styx in. Snowblind is a powerful song about cocaine addition, where Styx replicate the highs and lows, veering between dark and moody to a much faster, harder edged sound. This roller coaster ride is followed by State Street Sadie from Paradise Theatre and Suite Madame Blue from Equinox as Styx dip into some of their greatest and most successful albums. They seem determined to give the fans what they want to hear. 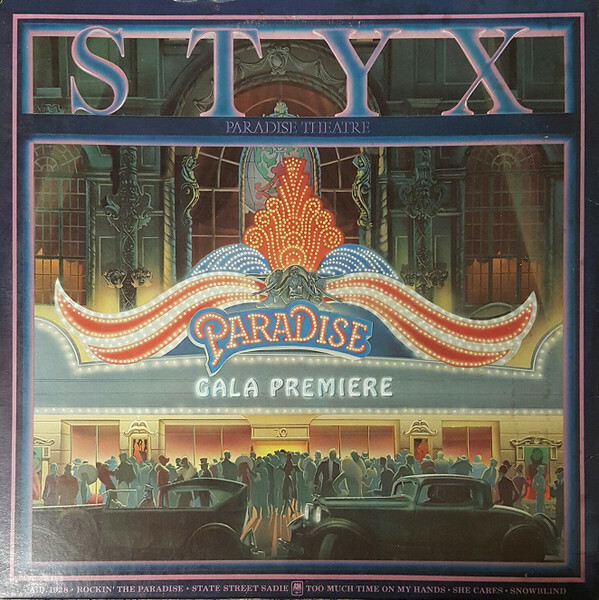 Given that Paradise Theatre was Styx’s most successful album, it was no surprise that they played several songs from that album, including Rockin’ The Paradise. Dennis DeYoung takes charge of the lead vocal while Tommy Shaw unleashes the first guitar solo and James “JY” Young. The two guitarists put their differences aside for the good of the band, who have given one of their best performances. After that, Styx play Blue Collar Man (Long Nights) one of the singles from the album Pieces Of Eight. This time, Tommy Shaw takes charge of the lead vocal and guitar, while James “JY” Young adds fills before stepping out of the shadows to deliver the final guitar solo. James “JY” Young then takes charge of lead vocal and guitar on his composition Miss America. The Godfather is in fine form and this continues as he delivers the lead vocal Don’t Let It End, while Tommy Shaw unleashes some searing guitar licks. He then switches between lead guitar and mandolin while Dennis DeYoung sings the lead vocal and plays accordion On Boat On The River. 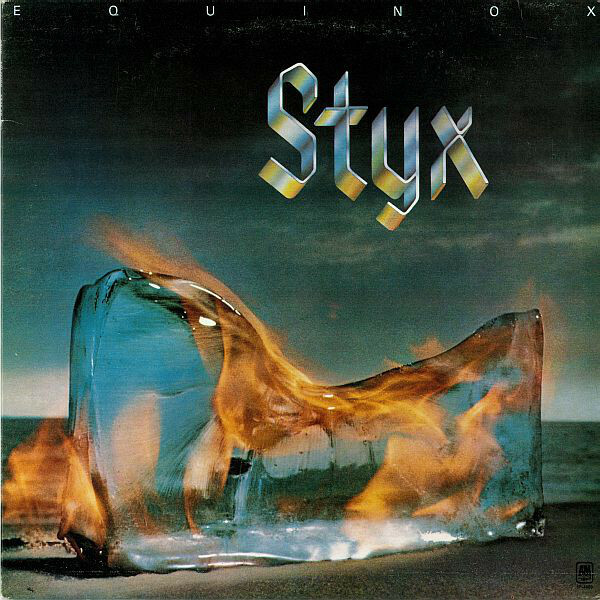 Styx return to their 1977 album The Grand Illusion for Fooling Yourself (The Angry Young Man) as Tommy Shaw sings the lead vocal and this time, the versatile Dennis DeYoung switches to synths. It’s a similar case on Crystal Ball while Tommy Shaw takes charge of the lead guitar and vocal on one of the first songs that he wrote as a member of Styx. Closing Caught In The Act Live was the prophetically titled Come Sail Away, where Dennis DeYoung who had been a member of the original band since he was fourteen, sings the lead vocal. After a standing ovation, Styx left the stage of Saenger Theatre. A year later, when Caught In The Act Live was released by A&M Records the five members of Styx had already gone their separate ways. Without a band to promote Caught In The Act Live, it was no surprise when the album only reached thirty in the US Billboard 200. This time, there was no gold or platinum disc for Styx. When Music Time was released as a single, it reached forty in the US Billboard 100, and gave Styx their twentieth hit single since 1972. For Styx this was the end an era. Although Caught In The Act Live was released after Styx split-up, by then, they were one of the most successful bands of the seventies and early eighties. One album had been certified gold in Germany and Canada plus three in America. There was also the small matter one platinum album in America, six in Canada, a double platinum album and three triple platinum albums. This was pretty good going for a band that was formed by twelve-year-old twins Chuck and John Panozzo and Dennis DeYoung who was fourteen. Twelve years later, they signed their first recording contract and over the next twelve years, went on to enjoy success beyond their wildest dreams. With the rest of Styx they became the living embodiment of the American Dream. Sadly, after eleven years recording and touring, Styx became a band divided, and after the Kilroy Has Here tour was over the group split-up. Nothing it seems, in music lasts forever, and proof of that was Styx. Even after selling over fourteen million albums in North America alone, they were unable to set aside their musical different. Just five years later, and Styx made a comeback, albeit the classic lineup of Chuck and John Panozzo, Dennis DeYoung, James “JY” Young and Tommy Shaw was a thing of the past. Styx’s 1990 comeback album was certified gold as was their 1997 followup album, Return To Paradise. It was Styx’s second live album and the first to feature drummer Todd Sucherman who had joined the group in 1995. A year later, founder member John Panozzo passed away in July 1996, and that day Styx lost the man who for so long had provided its heartbeat. It was the end of another era. Since the release of Return To Paradise in 1997, Styx have continued to record and tour. They’ve released three studio albums and five live albums and they still remain a popular live draw. However, for many people Styx’s best years were between their 1972 eponymous debut album and 1984s Caught In The Act Live which was recently remastered and reissued as a two CD set by BGO Records. ← CHARLIE RICH-TOO MANY TEARDROPS: THE COMPLETE GROOVE AND RCA RECORDINGS.